Challenge Roth is one of the biggest and best Ironman-distance triathlons in the world, and yet it remains virtually unknown outside of Europe. Canada, with 1/10th the population, had more participants than the US. I understand why most triathletes dream of Kona; there’s a lot of history and prestige there. But Challenge Roth is every bit as desirable and in several ways superior. 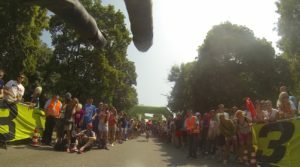 There are a lot of great races, but if you’re looking for the ultimate Ironman-distance race experience, Roth should be at the top of your list. The Good: There’s a lot to love about Roth; it’s known as The Best Old Race for a reason. Here’s my highlight list. Solar Hill (bike course): This is the highlight of the course. If you’ve ever dreamed of being cheered-on as if you were in the Tour de France, this is your chance. The hill is lined with people, 10 deep in a few spots, for about a mile. Pretty much everyone is cheering, encouraging, and offering high-fives. The crowd pushes you up, not literally, but figuratively. The Canal Bridge (swim start): It’s an amazing site to look around the swim start and see thousands of people along the bridge and the shore. It makes you feel like you’re a part of something special, and helps distract from any pre-race jitters. The Beer Mile (within Roth): Toward the end of the bike course and also the end of the run course, tables and chairs line both sides of the street. The spectators here are focused as much on their beers as cheering, which makes it a fun and different experience than the rest of the course. The rumor is that participants can stop there and have a beer as well, but I didn’t see anyone do it. The Largest Ironman-distance Race in the World: It’s pretty awesome to be part of a race with 3500 individuals and 650 relay teams. This could be a negative aspect if the race were poorly organized, but the organizers and volunteers are very experienced at making sure everything is perfectly coordinated. The Fastest Ironman-distance Course in the World: The fastest men’s and women’s times at the Ironman distance are at Roth: Andreas Raelert (7:41:33 in 2011) and Chrissie Wellington (8:18:13 in 2011). So it’s clear that Roth has something going for it. Perfect Swim Course: A perfectly straight, calm, cool-but-not-too-cool wetsuit legal canal. The 2 turn-around points are marked by bridges. One bridge is packed with fans, and spectators can walk along the bank. What more could you ask for? I’m generally not a fan of mass starts, but I had no issues with this one. There were about 25o people spread-out across half the width of the canal and some along the bank; this resulted if very little knocking and kicking of one another. Beautiful Bike Course: Germany is a beautify country, and the bike course has some beautiful views of the countryside when not passing through a town and cheering crowd. Flat Run Course: I hate running hills and there was very little for me to complain about on this course. Much of it is on a hard-packed gravel trail along the canal, which is easier on the joints than hard road surfaces. Moderate Temperatures: Central Europe typically has mild summers and the high temperature is around 80F to 84F (27 -29C) with low humidity. This no doubt contributes to faster finishes. Pre-Race Carbo Party: I thought this was going to be ultra lame and not worth the effort, but I was actually glad that I attended and I enjoyed the festivities, announcements, and interviews. The pasta was pretty good and the local meats, desserts, and alcohol-free beer were fantastic. No Qualification or Lottery Required: Unlike Kona, all you have to do is sign-up – no qualification or lottery process involved. However, you’d better be extremely punctual, because the race fills within a couple of minutes of online registration opening. Relay spots fill within a matter of seconds. If you want to guarantee yourself a spot, you need to know someone participating in the current year’s race; they can sign one friend (as well as themselves) up for the following year’s race – this option is available only on-site the day after the race. There are also a few (about 200) spots offered via online registration in December if you’re feeling lucky and missed the initial chance. Extremely Competitive Relay Teams: I found it very interesting that the relay teams at Roth are extremely competitive. My misconception was that relay teams are usually made up of people who don’t want to do an entire triathlon. I was shocked to hear that some teams pay professional runners from Kenya to be on their team! Triathlon Park Stadium & Finish Line: For me, this was the most spectacular site in all of Germany. Any finish line at the end of a race this long probably would have qualified, but it’s especially rewarding to run the final distance through a stadium of cheering fans and being greeted by friendly volunteers offering congratulations and finisher medals. The Bad: No race is perfect, and there are some drawbacks. I’m not sure that many of these could realistically be addressed, but it’s good to know what to expect beforehand. Travel by Plane: Any event that requires a plane trip is a pain, especially if you’re bringing your bike. Flying into Frankfurt, Germany is no exception. It makes me appreciate the simplicity of local races. Limited Hotel Rooms: Roth is a small town, and the surrounding towns are even smaller. If you don’t get a hotel room 12 months in advance, you won’t be staying near Roth. The good news is that camping is an option and home-stays with locals are common. But if you prefer a hotel, you’ll be driving quite a ways. I’ve heard very good feedback for Nirvana travel if you’d rather have someone coordinate everything for you. Not so much of a crowd for the 2nd bike loop or run: The crowd during the swim and the first lap of the bike course was awesome. If you’re one of the elite athletes who can finish in under 10 hours, you can expect the second loop of the bike course and few sections of the run course to have a lot of spectators. But if you’re much slower than this, don’t expect a great deal of cheering to help you through the second half of the race. Compared to other races, there were still a lot of people on the course, but no where close to as many as during the first half. But don’t worry, they’ll at least be there at the finish line. Somewhat Boring Run Course: The majority of the run course is out-and-back along the canal. Trees on one side, water on the other. While it was beautiful for the first mile, it was repetitive and seemingly endless for the rest. At least the turn-around points offered some variety. Aid Stations Tended to be Closed for the Last Finishers: I talked to people who were out on the course during the last 2 hours. The aid stations were closing and/or were out of supplies. These are the people who need nutrition the most. For participants who finds themselves on the course when the sun is setting, start stocking up as much as possible at the nearest aid station. 15-hour Cut-Off Time: Most Ironman-distance races have a cut-off time of 17 hours. Roth has a 15-hour cutoff (2:10 for the swim, 9:30 for the swim+bike.) This shouldn’t be a factor for most participants, but keep this in mind in case your race doesn’t go according to plan.